7 Awesome Stats from NFL Week 4 - Fantasy Football, Fantasy Football Rankings | Mac Bros.
Week 4 of the NFL season has finally come and gone. Let's look back at 7 feats of statistical awesomeness. 1. New York Jets running back LADAINIAN TOMLINSON rushed for 133 yards in the Jets’ 38-14 win at Buffalo. Tomlinson, who now has 25 games with at least 100 rushing yards and two rushing touchdowns, tied Pro Football Hall of Famer JIM BROWN for the most such games in NFL history. Tomlinson has 12,831 career rushing yards and passed Pro Football Hall of Famer TONY DORSETT (12,739) for the seventh-most rushing yards in NFL history. 2. 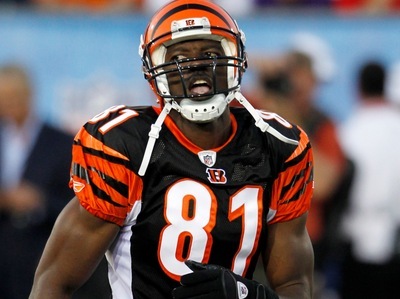 Cincinnati wide receiver TERRELL OWENS had 10 catches for 222 yards and a touchdown in the Bengals’ 23-20 loss at Cleveland. It marked the third 200-yard receiving game of his career, tied for the fifth-most in NFL history. Owens is one of only eight players all-time with at least three 200-yard receiving games and he is the only player to record a 200-yard receiving game with three different teams (Cincinnati, Dallas, San Francisco). Owens has 15,325 career receiving yards and surpassed ISAAC BRUCE (15,208) for the second-most receiving yards in NFL history. 3. Indianapolis quarterback PEYTON MANNING had 352 passing yards in the Colts’ 31-28 loss at Jacksonville. Manning has 51,493 passing yards and surpassed Pro Football Hall of Famer JOHN ELWAY (51,475) for the third-most passing yards in NFL history. Manning and center JEFF SATURDAY started their 158th game together, passing Buffalo’s JIM KELLY and KENT HULL (157) for the most games started by a quarterback-center combination since the 1970 merger. 4. Green Bay cornerback CHARLES WOODSON had a 48-yard interception-return touchdown in the Packers’ 28-26 victory over the Detroit Lions. Woodson has 10 career interception-return touchdowns and joined Pro Football Hall of Famer ROD WOODSON (12) and Saints safety DARREN SHARPER (11) as the only players in NFL history to have at least 10 INT-TDs. 5. San Diego tight end ANTONIO GATES had seven catches for 144 yards and two touchdowns in the Chargers’ 41-10 victory over the Arizona Cardinals. Gates has 503 receptions in 113 career games, reaching 500 receptions in the third-fewest games by a tight end in NFL history. 6. Atlanta tight end TONY GONZALEZ had seven catches for 41 yards in the Falcons’ 16-14 win against the San Francisco 49ers. Gonzalez (12,012) became the first tight end in NFL history with 12,000 receiving yards. 7. Houston running back ARIAN FOSTER rushed for 131 yards and had 56 receiving yards in the Texans’ 31-24 win at Oakland. Foster (537 rush yards, 152 receiving yards) became the third running back in NFL history to total more than 500 rushing yards and 100 receiving yards in the first four games of a season, joining Pro Football Hall of Famer EMMITT SMITH and BILLY SIMS .